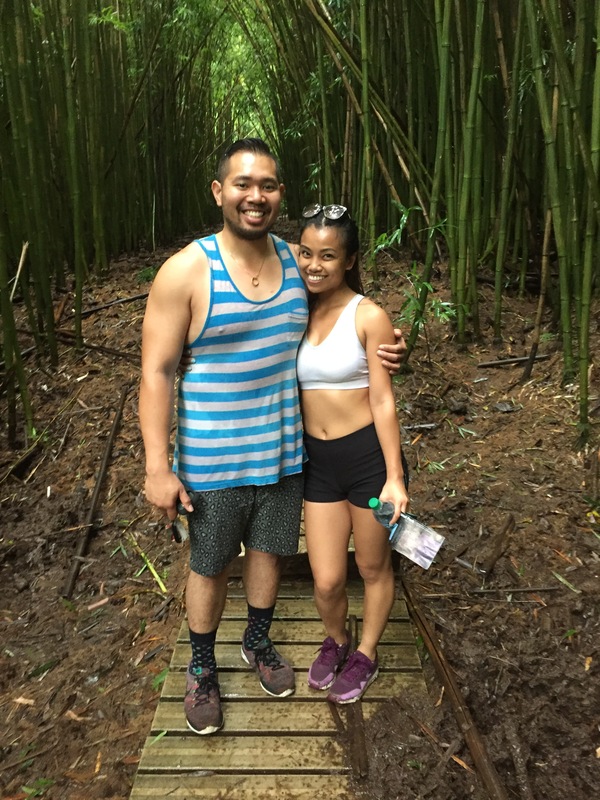 For my 26th birthday, my love and I chose to go to Maui, HI! 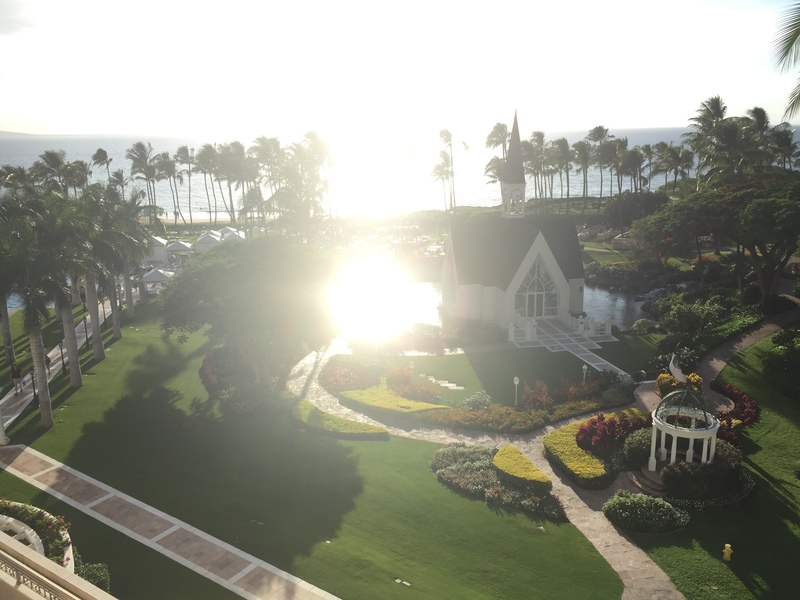 We stayed for 7 nights in an AirBnb in the Waiohuli Beach Hale beachfront condo complex. 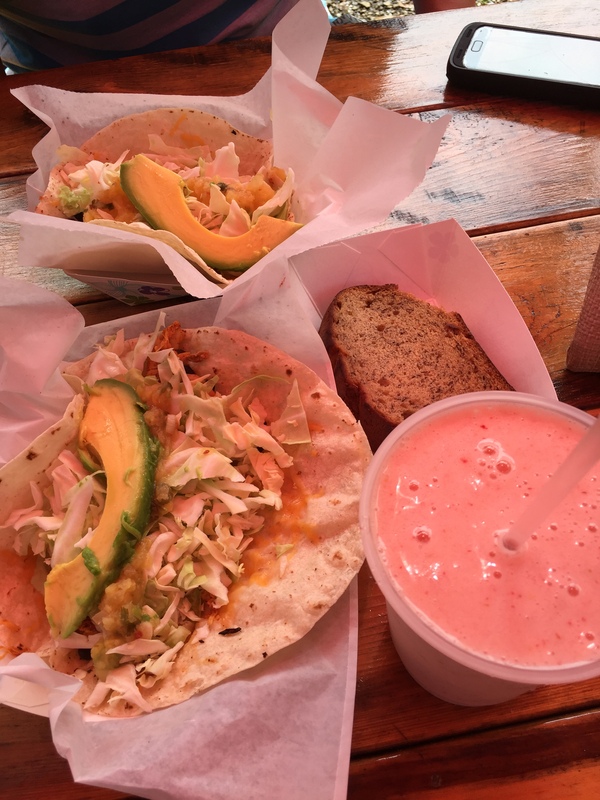 Since I’m probably going to ramble on too much about the little details of our stay, I’ve categorized my post between food, shopping & activities in case you’re particularly interested in reading up on one versus the other. I’ve also included a little palm tree rating system for all of the restaurants I’ve reviewed below! 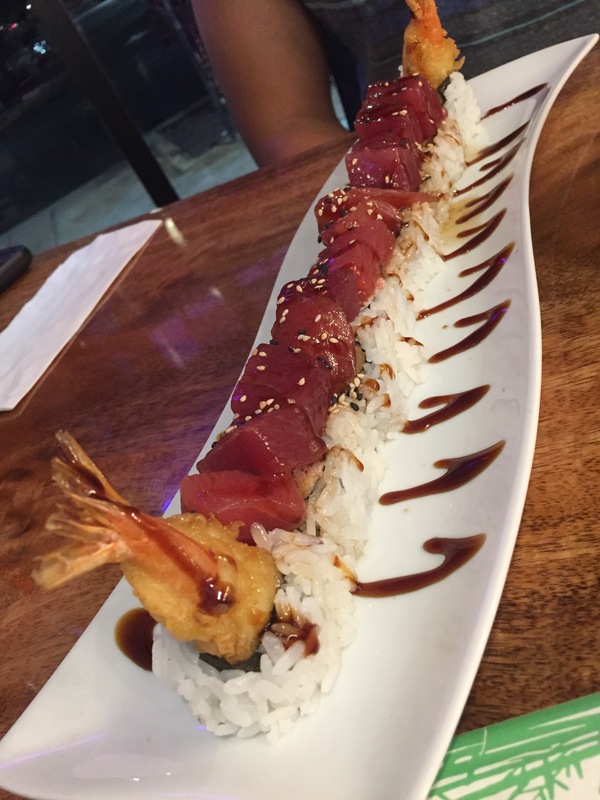 There were only 3-4 other customers in when we got there but overall it seemed to have a great atmosphere. 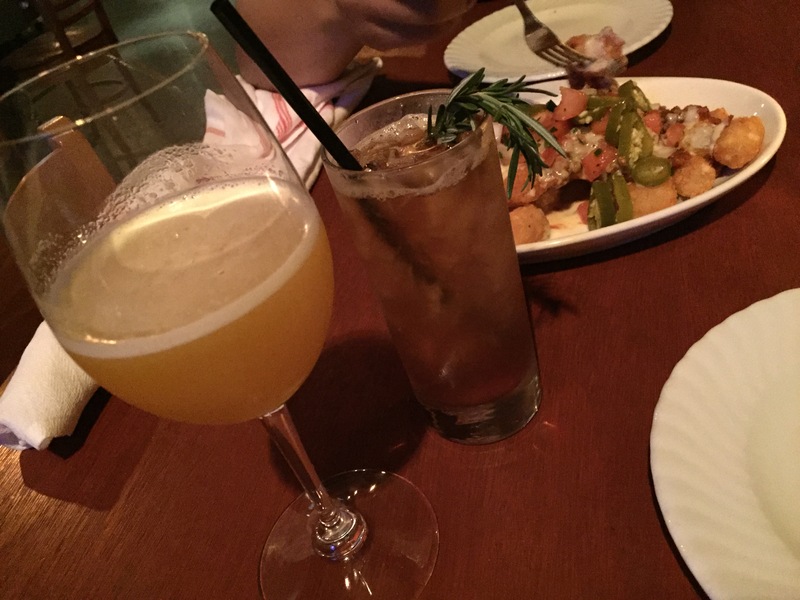 I ordered the Menehune cocktail and Bacon Jam burger (which I really enjoyed had there been slightly less bleu cheese – but I’m not much of a cheese fan to begin with so it wasn’t that they went overkill with it). 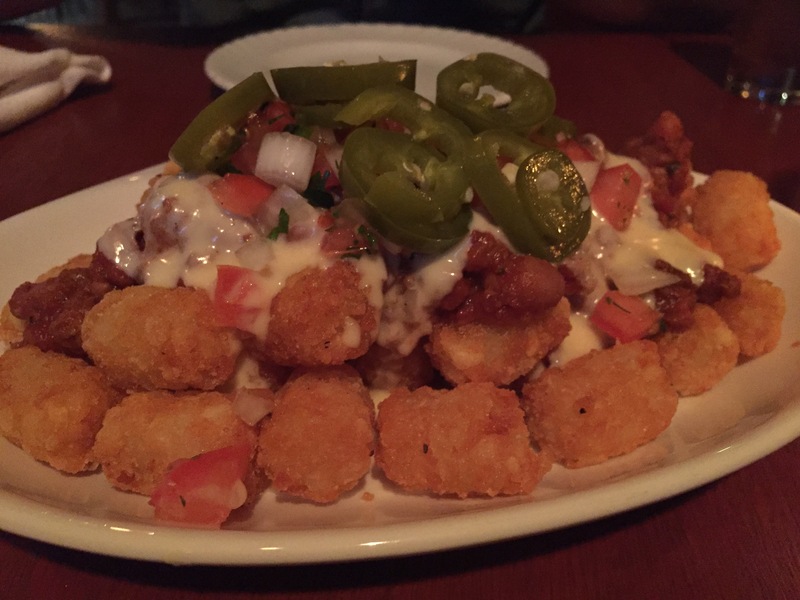 Daniel ordered the House burger & loaded tots. 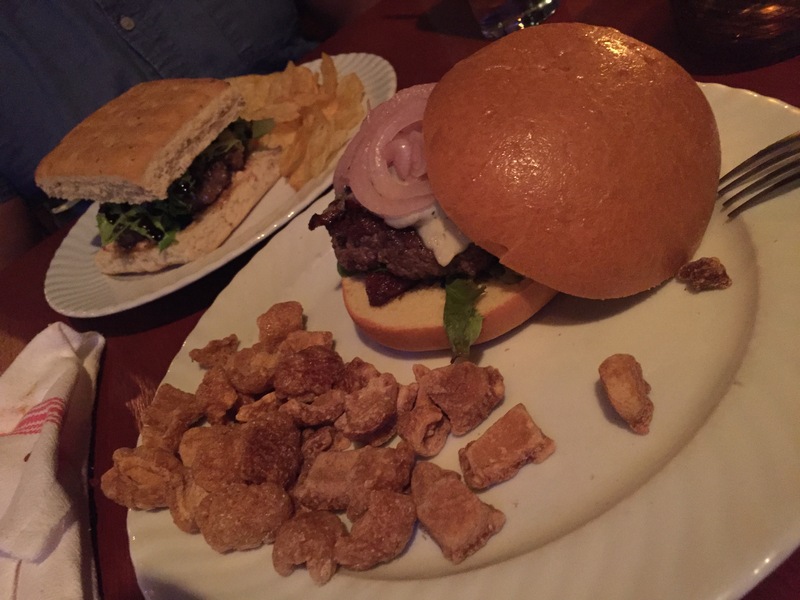 Chicharonnes were the standard side opposed to the typical french fry which was a welcomed change since I was ready to drown myself in all things Hawaii! 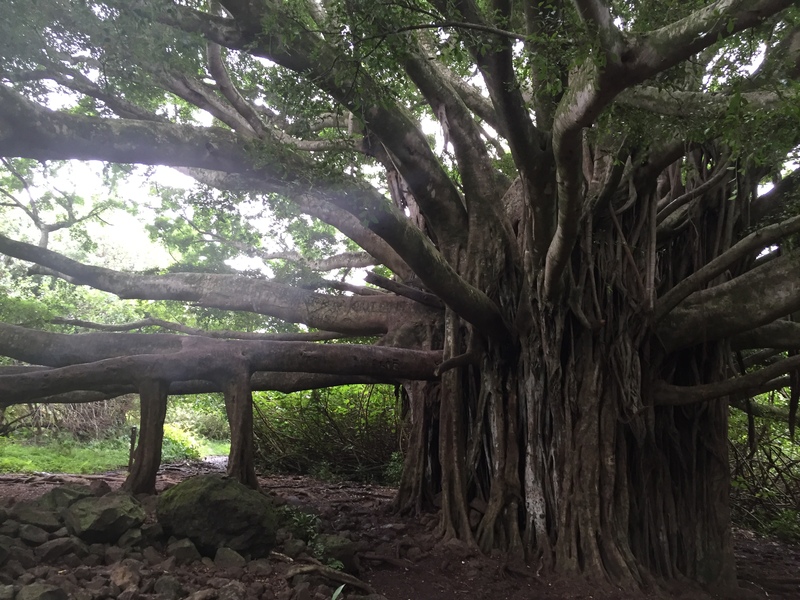 A short 4 minute drive from where we stayed brought us to the Kihei Kalama Village. There were a couple cute restaurants that lined the road as soon as you pulled up. 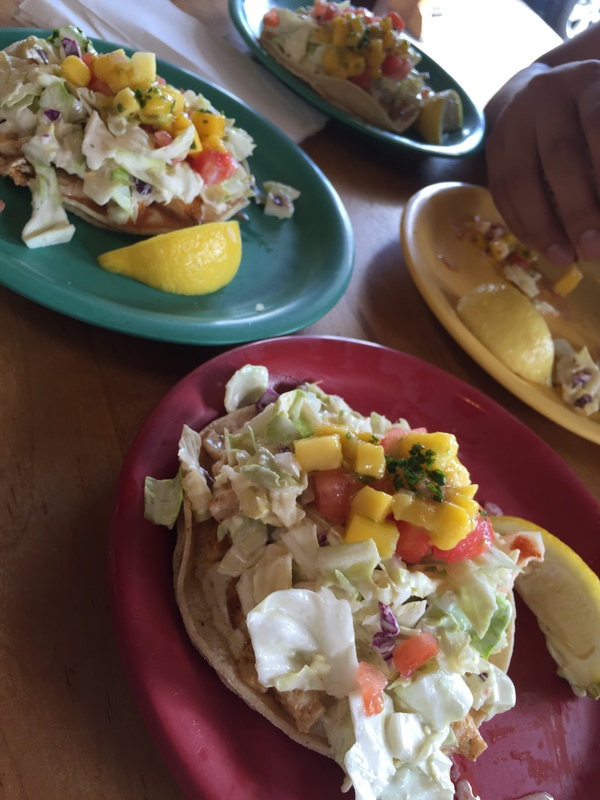 We were eyeing the plates of all the customers at the KIHEI CAFE (& boy did they look yummy!) which had cute patio tables & umbrellas lined right in front of the OHANA SEAFOOD BAR & GRILL restaurant. We walked through a gap in the greenery which appeared to be the entrance and walked up the steps thinking we’d be eating at the cute patio tables out front but turns out once we took those few steps up it was all OHANA, lol. Definitely a little confusing the way they had that set up, but we settled anyway. 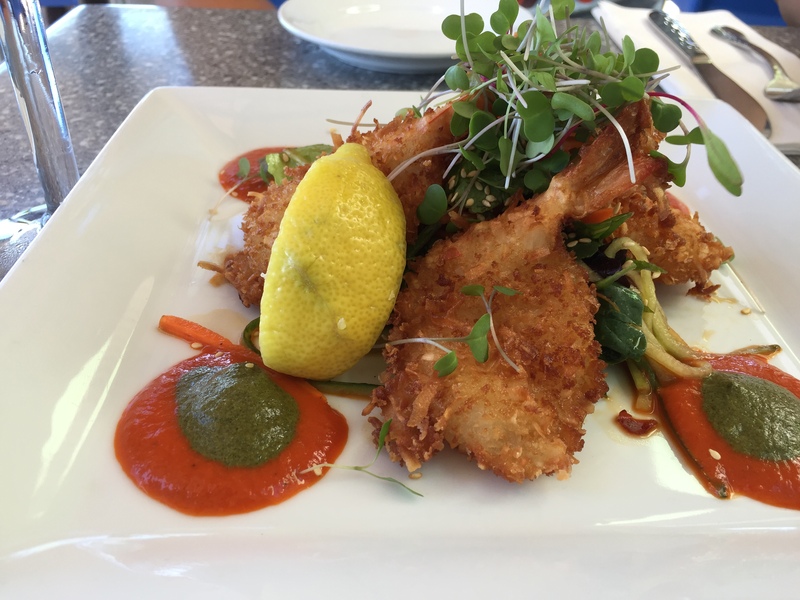 Of course we had to eventually come back another day to try out the Kihei Cafe as well. The sign in front of the little hut where you order tells you to order first and then they’ll help you find a table. They don’t help you find tables lol. 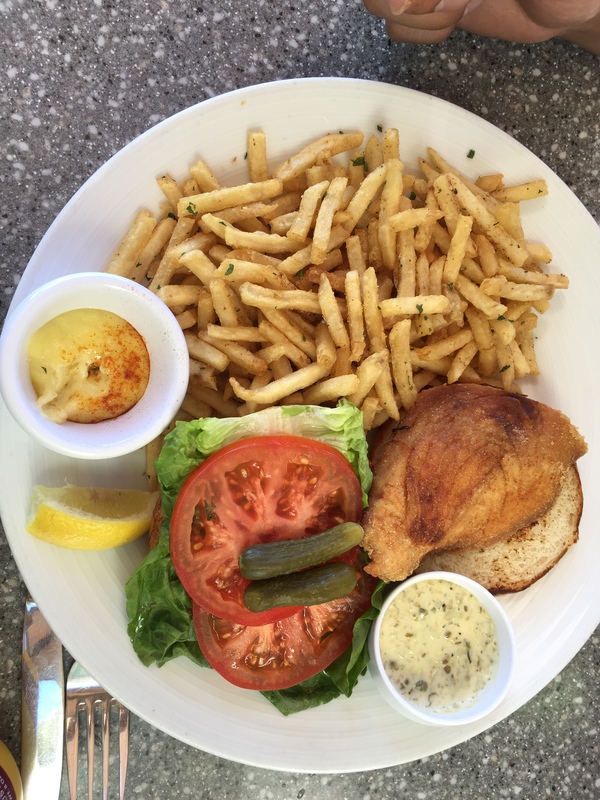 You get in line to place your order and then hopefully find a seat outside which can feel a little cramped if you don’t luck out with a regular table and instead snag some seats at the more community-like setup. 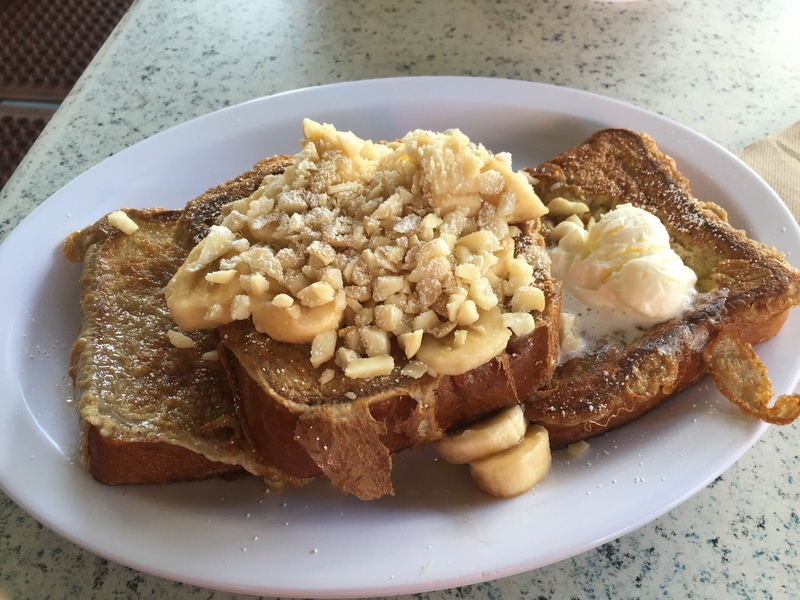 I ordered the French Toast with bananas and macademia nuts = two thumbs up! They also had a coconut syrup available on the table if you wanted to try something other than maple. 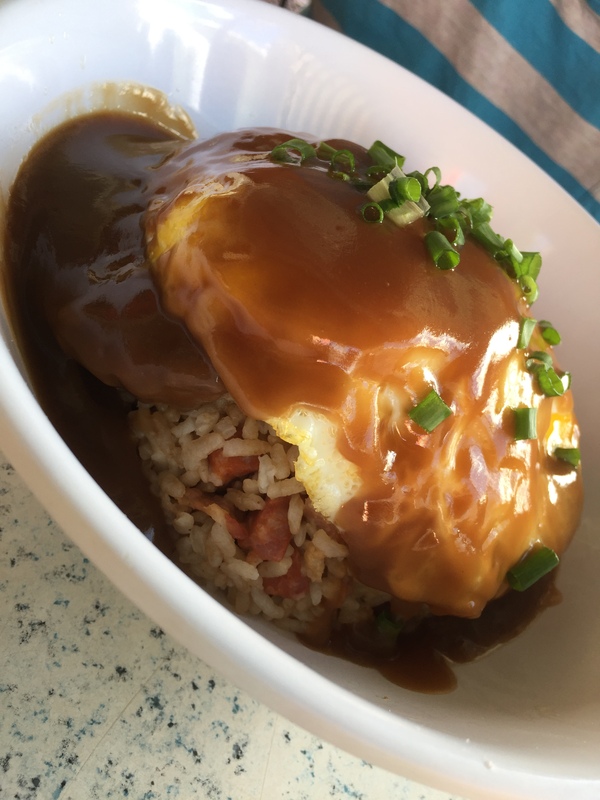 Daniel stuck with his loco moco again but this time he ordered it with pork fried rice. This is also a great people-watching spot being right across the street from the beach and alongside other touristy shops. I would recommend this place on the hilariousness of the menu alone! 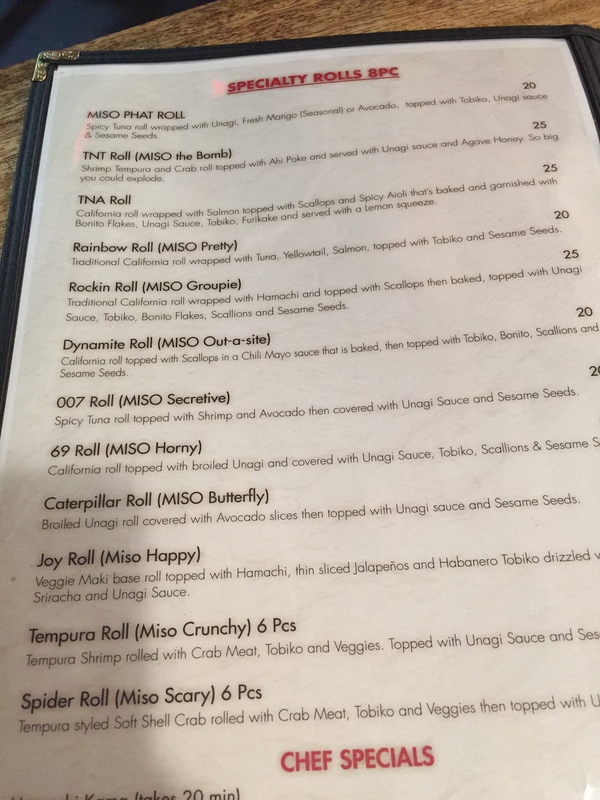 Loved how they had the regular name of the roll followed by a related Miso “_______” expression. 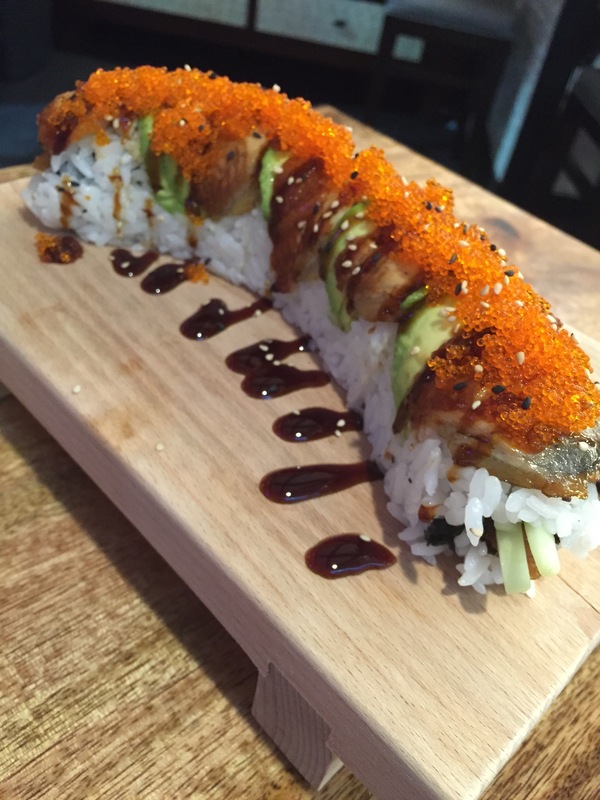 My favorite (name-wise) is definitely the Caterpillar Roll aka Miso Butterfly. I was dyinggggg! 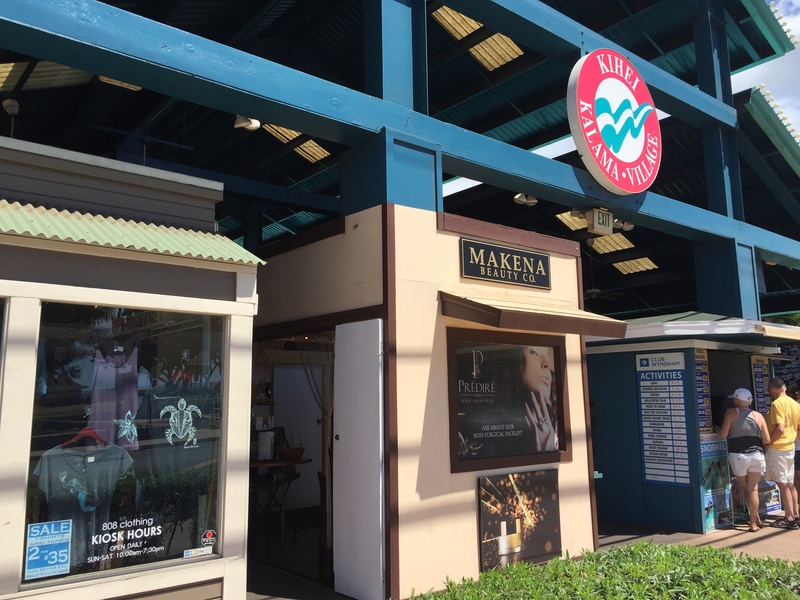 Lol anyway, this place is fairly expensive (I hear the one in Lahaina is cheaper – we went to the one in Kihei.) 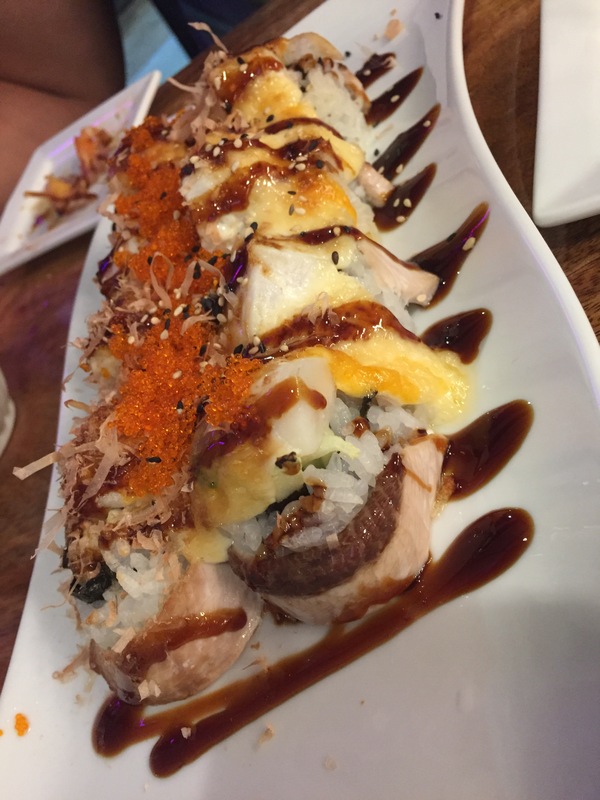 But it was good sushi! 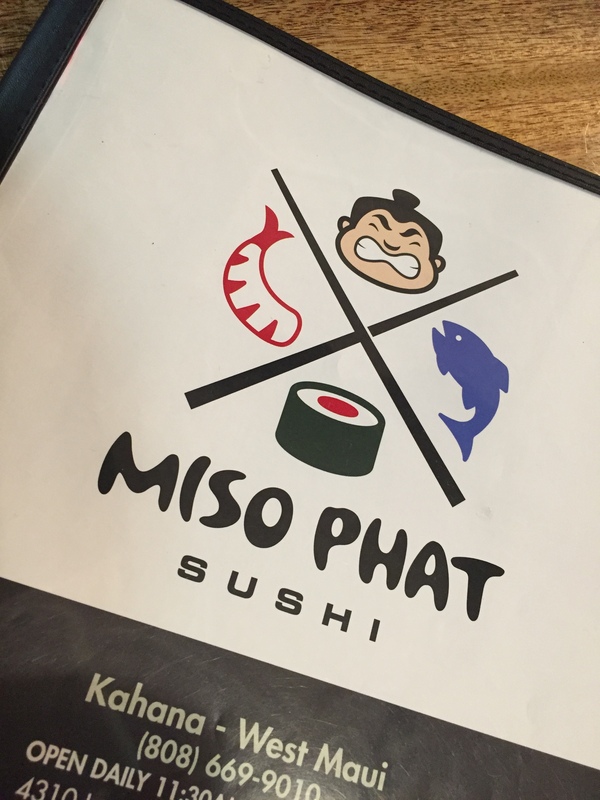 We ordered the MISO PHAT Roll, the TNT Roll, & the Rockin Roll. 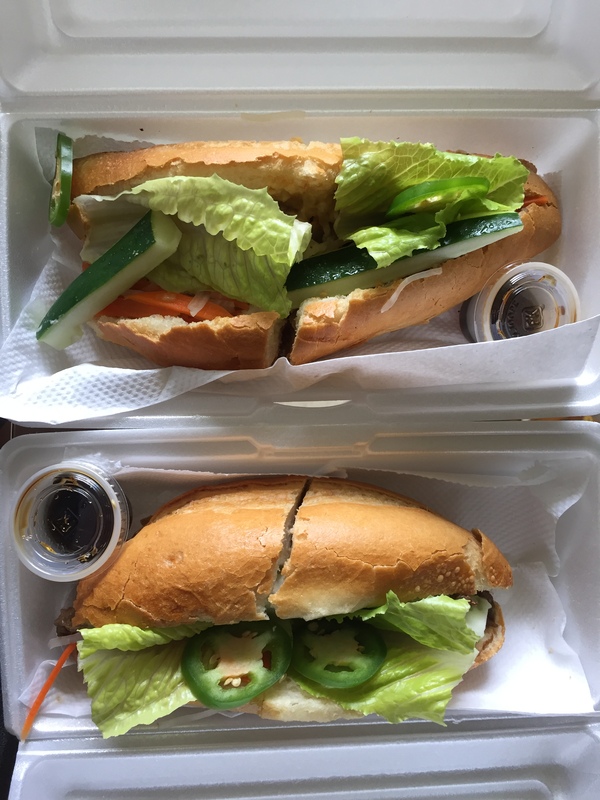 I love Vietnamese food, so when Daniel said Banh Mi while he was looking through more food places to try – I immediately said yes! 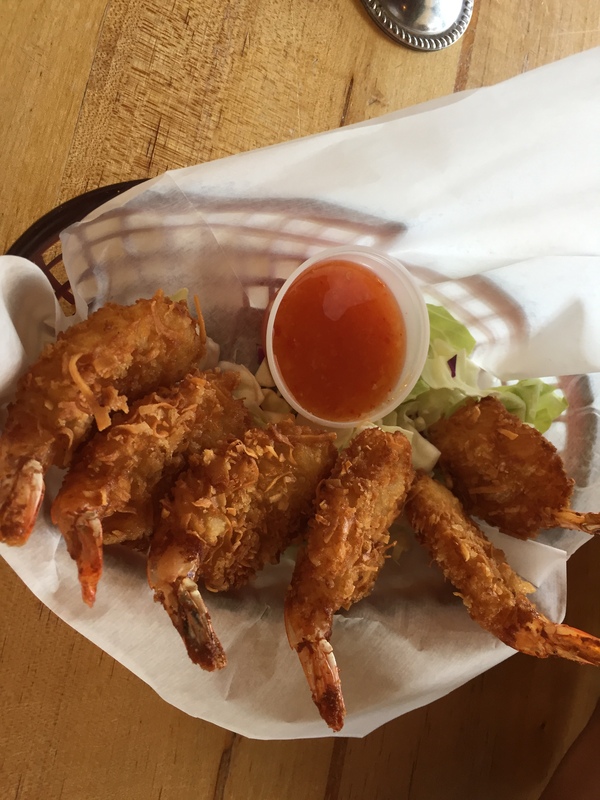 Fun fact – before we started dating, he would always share his Banh Mi sandwiches with me… I guess it was his way of planting the seed 🙂 Anywho, this little hut, appropriately named “Vietnamese Food To Go” got rave reviews. 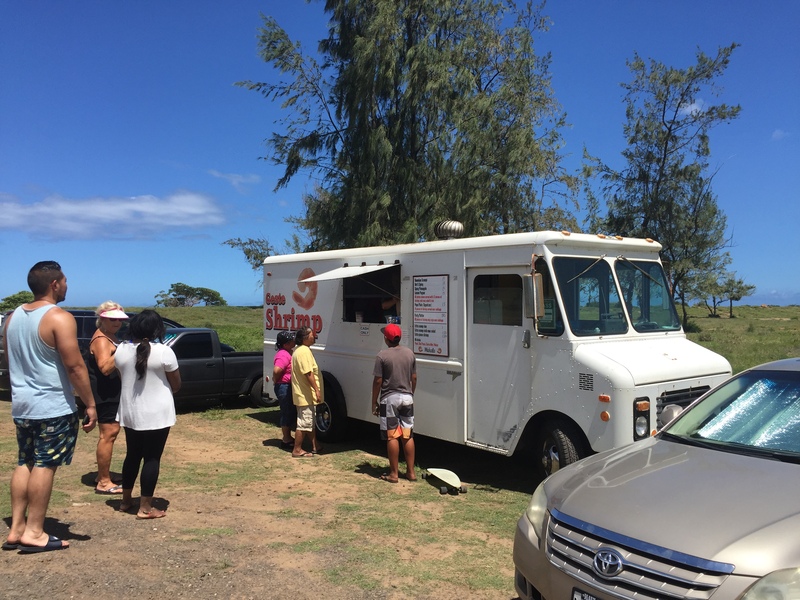 It was located right near Kihei Kalama Villege and all those other little shops on the road. 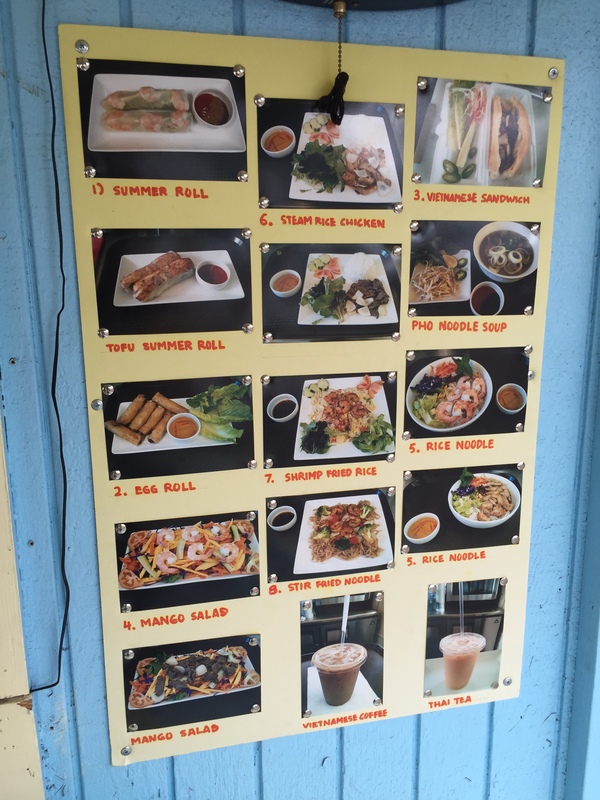 We ordered the summer rolls, our Banh Mi sandwiches & of course I couldn’t pass up a Thai Tea. The Banh Mi was $8 and it didn’t blow either of our minds (we’ve definitely had our fair share of banh mi). I personally think it could’ve packed in a little more meat. Maybe their rave reviews were for their pho? 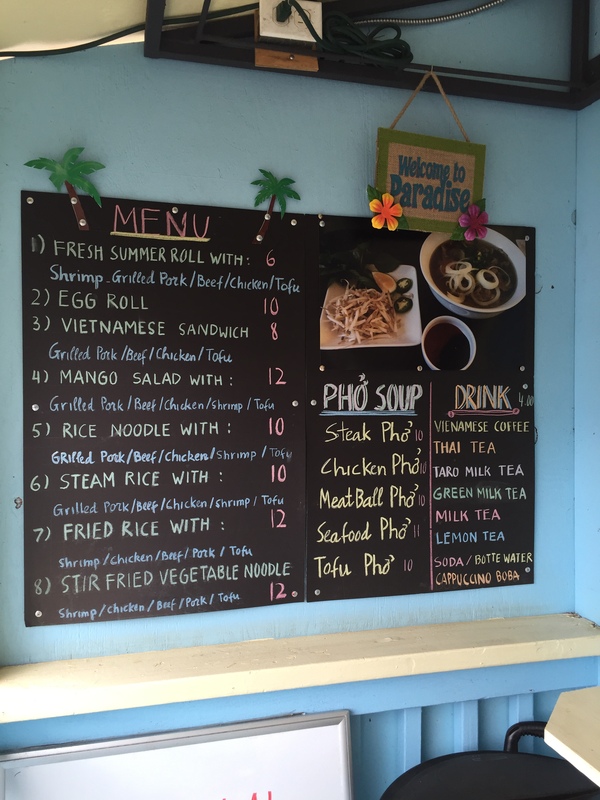 Although I can’t imagine anyone wanting to eat pho in that hot weather! Okay, this place was pretty good, but it wasn’t memorable, hence the 2 palm tree rating. It just happen to be on the way to somewhere else we wanted to go. The view is gorgeous and supposedly the water was just unseasonably murky due to some runoff elsewhere, i don’t know lol. Our server was great also, so kudos to him. 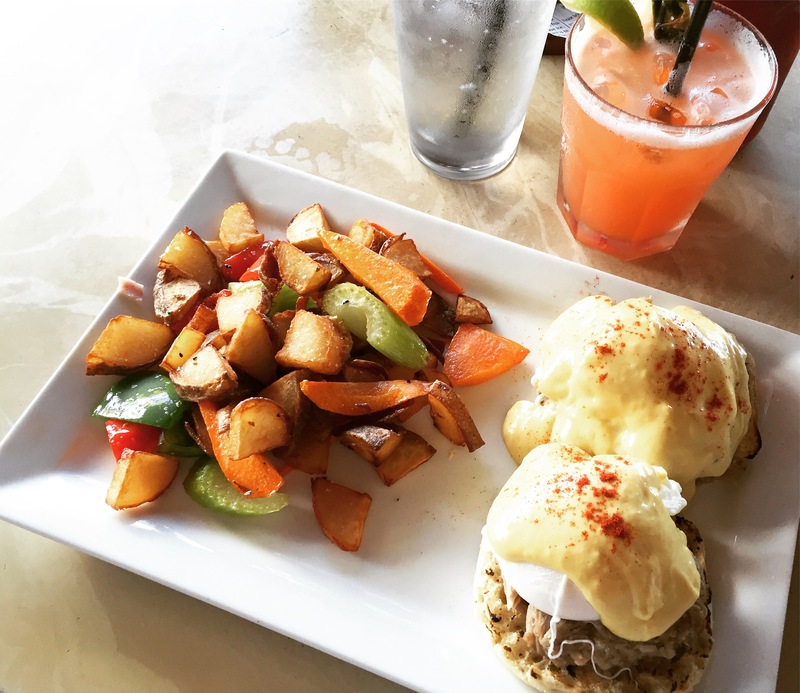 If you’re nearby and hungry, check it out! But I wouldn’t go out of my way for it. 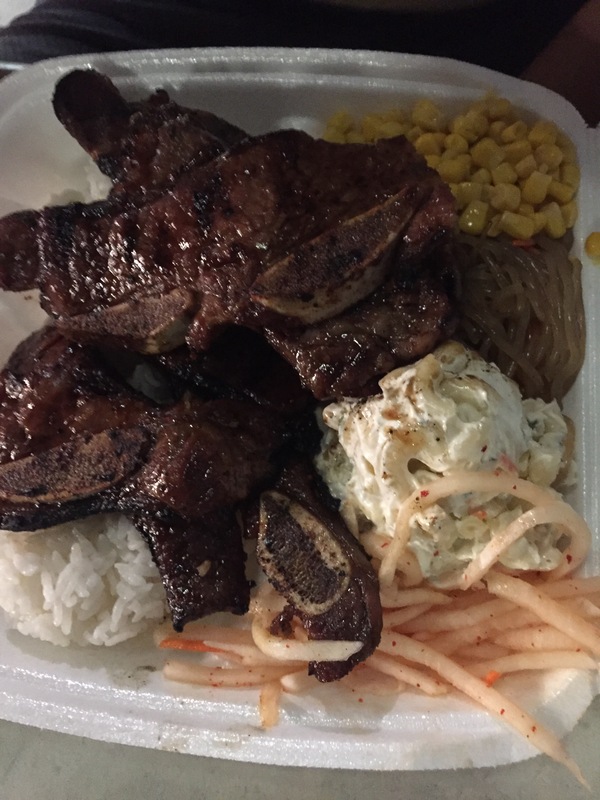 In Queen Ka-ahumanu Center is Pearl’s BBQ. 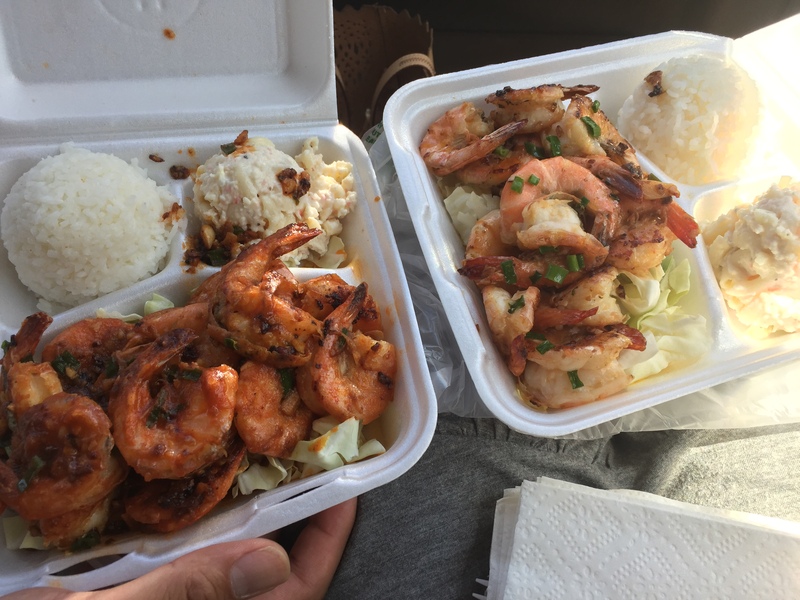 So funny thing is, this food was HELLA good, like probably the best LOL. But neither of us wanted to dub it our “must-try” because its from a food court in a mall for goodness sake! We came into the mall just trying to kill some time before our flight and figured we’d grab some food so we have something to eat on the plane. 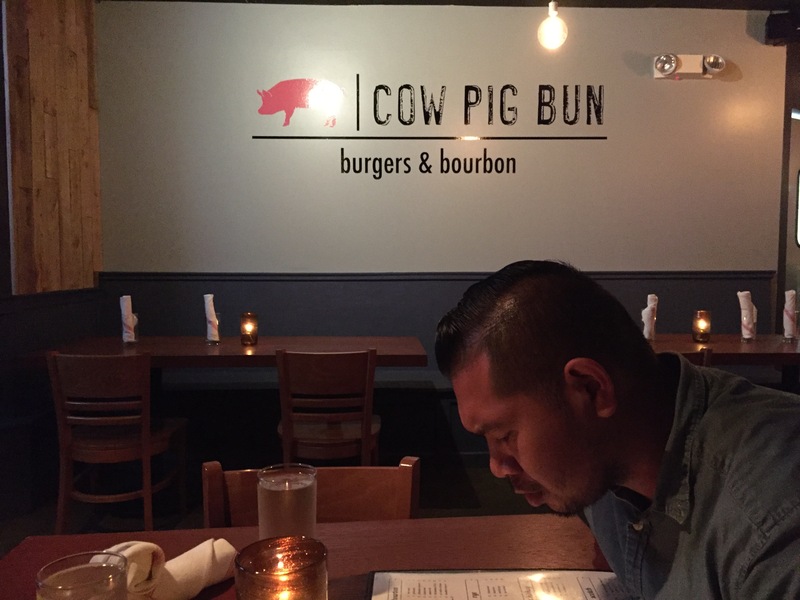 Daniel almost got L&L when a shot him a side-eye and told him there’s L&L at home and he should just get Pearl’s BBQ with me because its virtually the same menu. It was a crap ton of food. You get FOUR sides. FOUR. & they have a variety to choose from and they don’t skimp you on your meat or rice portions either. The short ribs Daniel got would make you drool for more, they were so good. 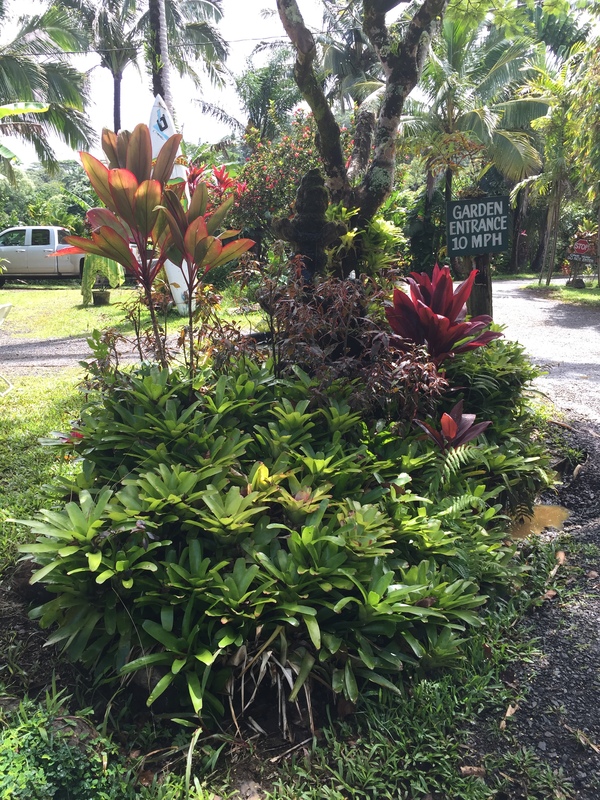 Coconut Garden Cafe is located right at the entrance of the Garden of Eden. If I remembering correctly it was like 8 bucks for a taco.. a single taco. 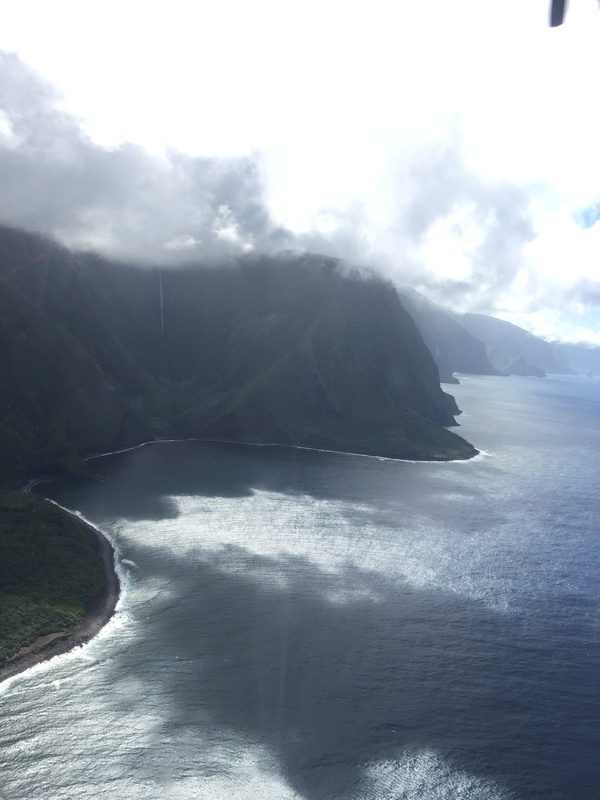 It was good, but keep in mind the Garden of Eden is on the Road to Hana. 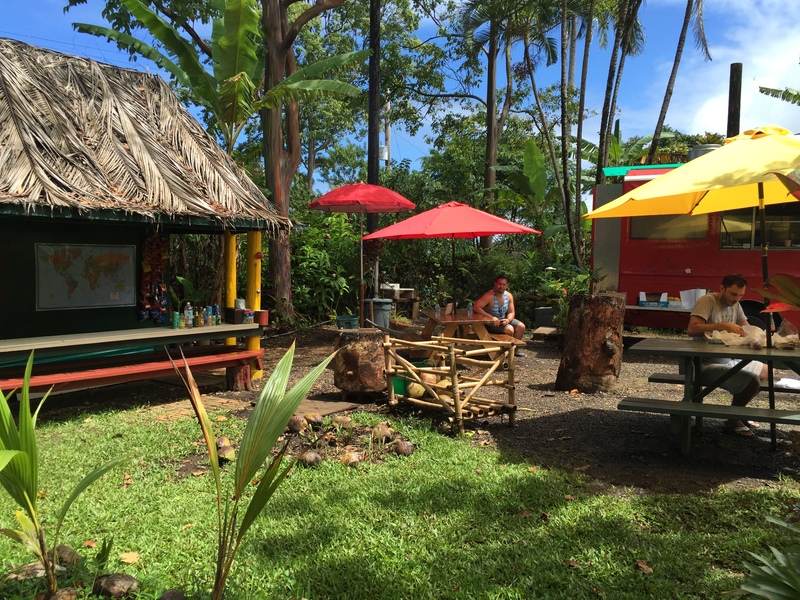 The Road to Hana has TONS of little pop-up food huts run by locals. I’m not sure the price range of them but I would probably stop by one of those instead next time around. Oh, and you should get some banana bread from one of them – so good!! This little shaved iced love shack was full of great energy and bright colors, I loved it. If your friend or family or significant other tells you shaved ice in Hawaii is not the same as the shaved ice you’ve tried from home, they’re probably right lol. My boyfriend was insisting it was so much better here and I didn’t REALLY know what shaved ice is until I’ve tried it here in Maui. He was right. 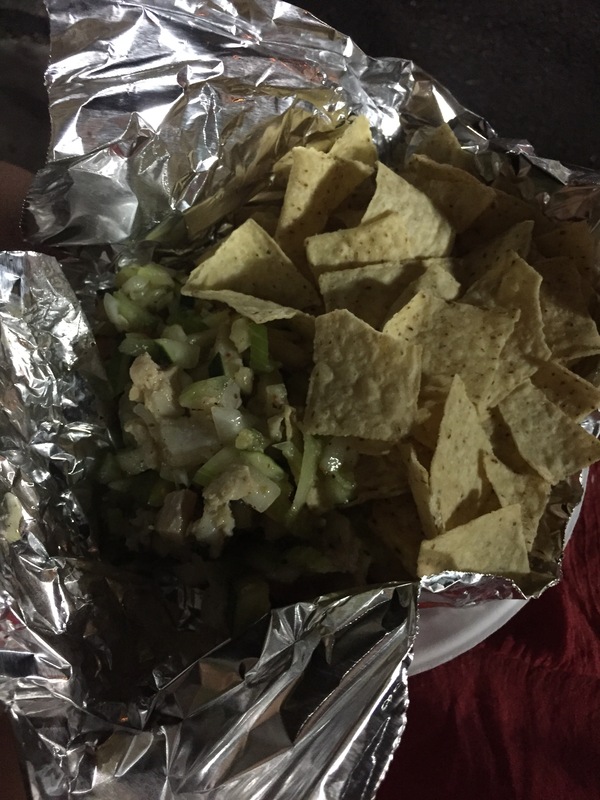 It just melts in your mouth and doesn’t start to just taste like ice once you’ve sucked all the flavor out. Honestly there was another shaved ice spot closer to Lahaina that had the slight upper edge to this one, but I still gave it a 4 palm tree rating because it had a THAI TEA flavor!! One thing I will say about shopping in Hawaii, it’s pretty much all the same everywhere you go. 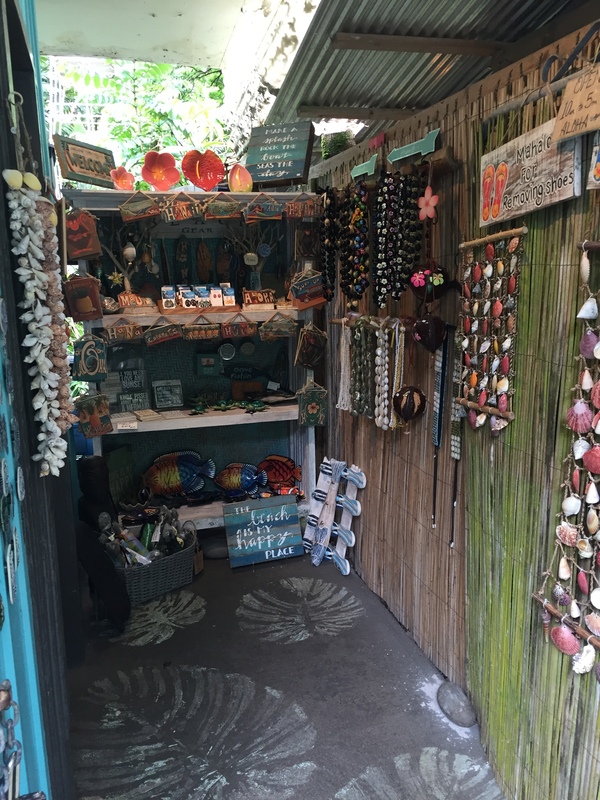 Shops consist of hand-carved tiki men, your souvenir shot glasses, all your shell & kukui nut necklaces, floral printed clothing & hand painted trucker hats. 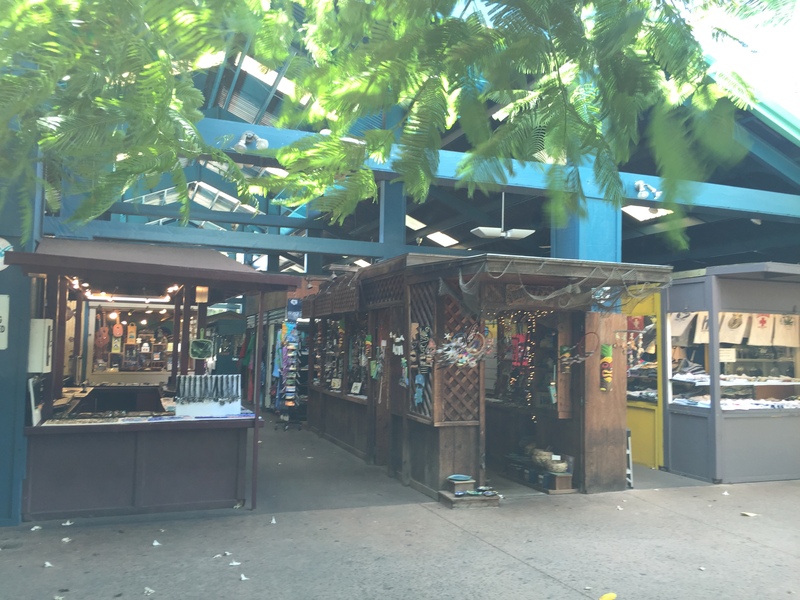 Kihei Kalama village was your expected ‘village’ of little souvenir shops or huts. 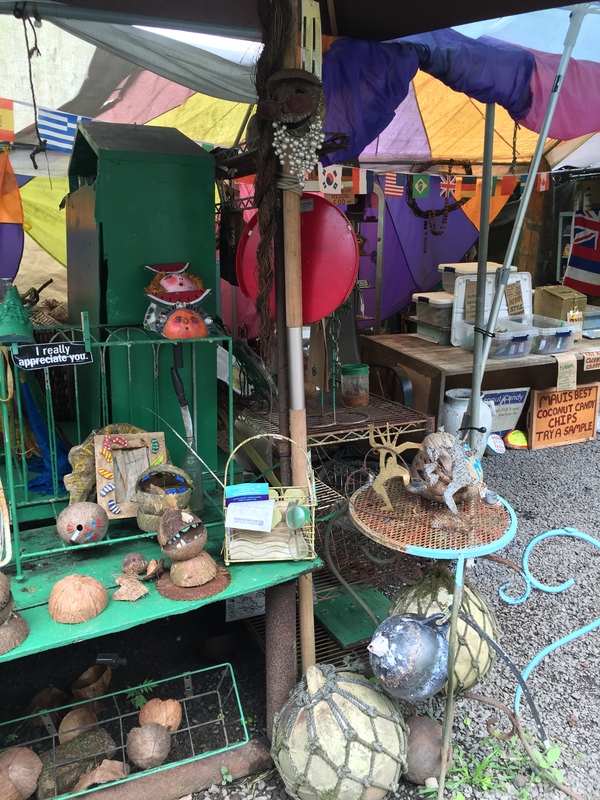 According to other reviews, it’s more on the pricier side – For me, I didn’t go in intending to buy anything since I had the Maui Swap Meet in the back of my mind. 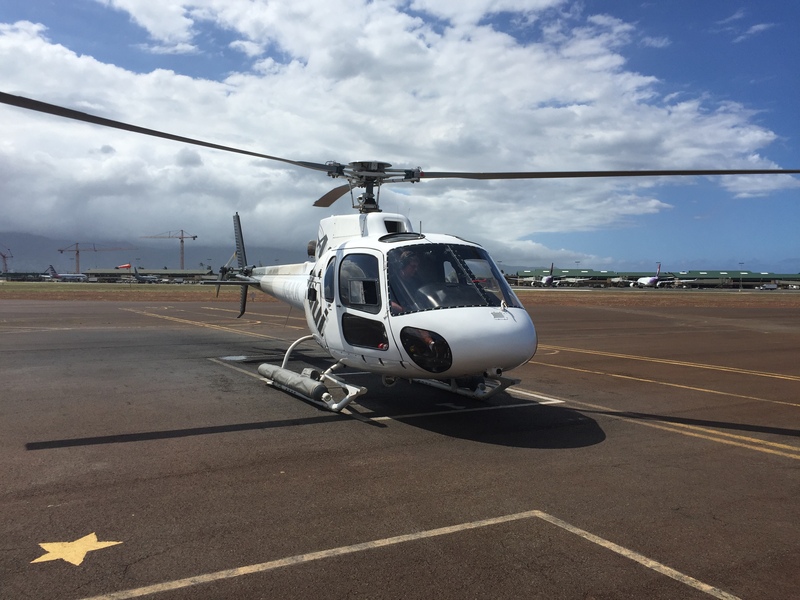 We did however stumble on the Tickets 4 Less hut which scored us more than $400 off on helicopter tour tickets and $40 off Luau tickets!! 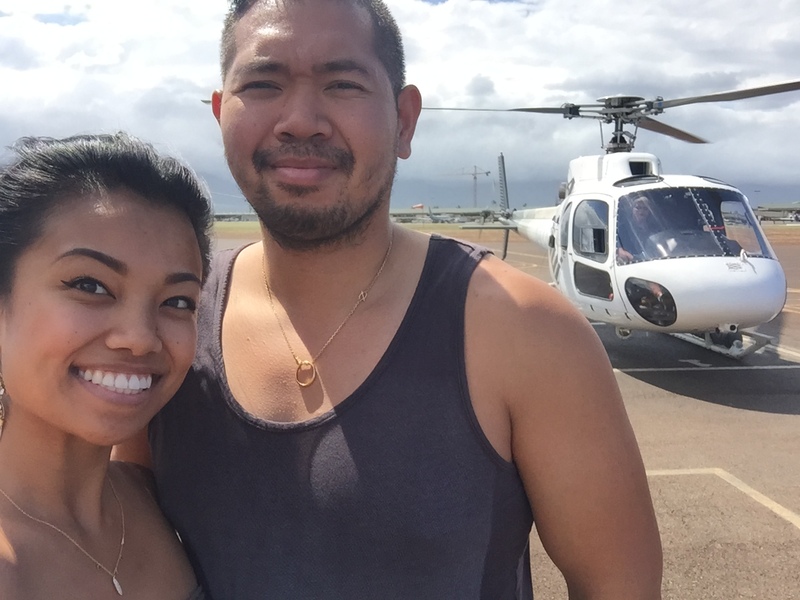 $120 for the both of us for a 45 min helicopter tour?!? I was ECSTATIC esp since I’ve always wanted to do it, but those tours are always too expensive. TIP: attempt to walk away first and tell them maybe you’ll come back – that knocked $60 bucks off his original offer 😉 Also, take a look at ALL the deals they offer and stack em up! Don’t just settle for one discount lol. Of course, it was one of those deals where you had to go to some vacation ownership presentation – so it’s your call if you want to take advantage of the deals in exchange for a few hours of your time. 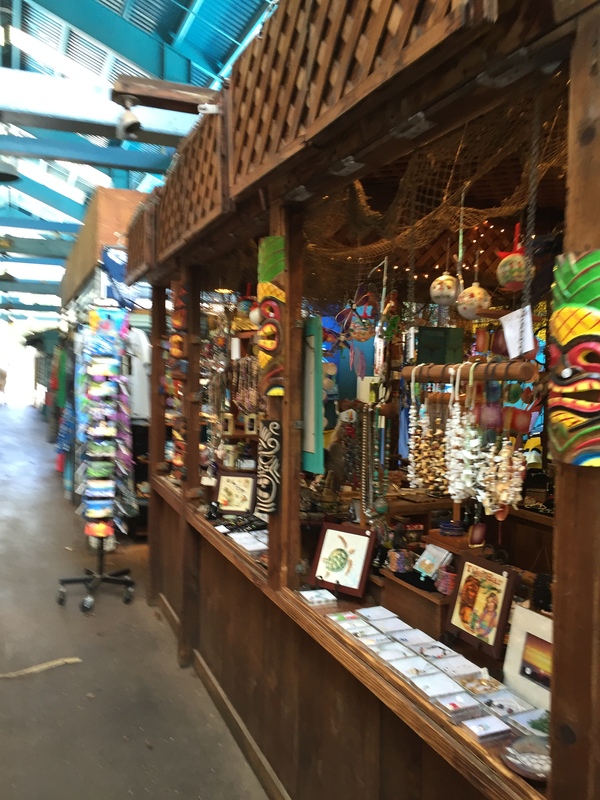 Every Saturday from 7:00am to 1:00pm, they have the Maui Swap Meet. It only costs 50 cents to get in. According to locals and other reviewers, this is where you want to go to pick up all your souvenirs! I had intended on being at the swap meet for maybe a couple hours but it really wasn’t nearly as big as I imagined it would be. There were some amazing hand-carved woodwork to be found though. I fell in love with a large hand-carved elephant and seriously considered purchasing it (but I’m not that impulsive shopper anymore thank goodness). 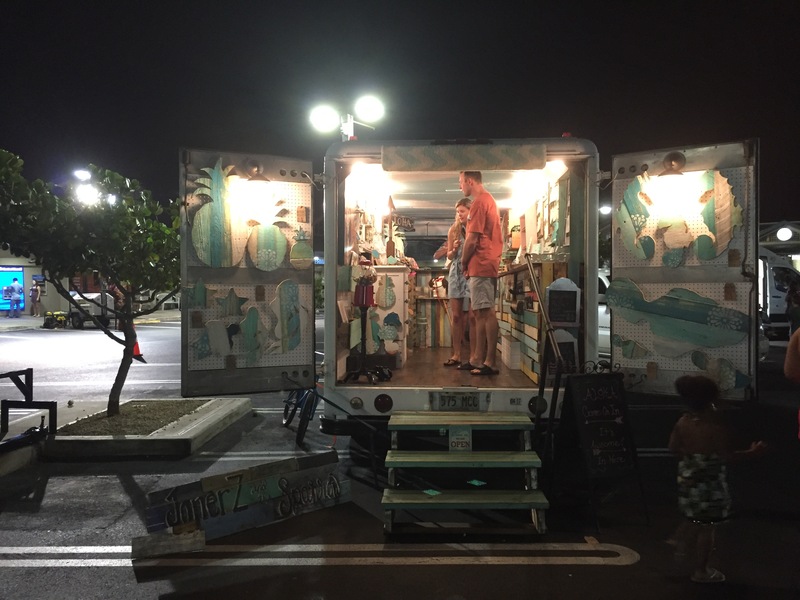 The woman who ran the booth was willing to sell it to me for a few hundred and insisted its always a better deal at the swap meet and that she had just sold a similar one at a Luau for $700 – significantly more expensive than what she was quoting me for it. Once we have a house of our own, maybe we’ll come back for it 😉 I did walk away with an amazing hand-embroidered hand bag though similar to the ones in the photo above, which I’ve been on the lookout for for a while now! 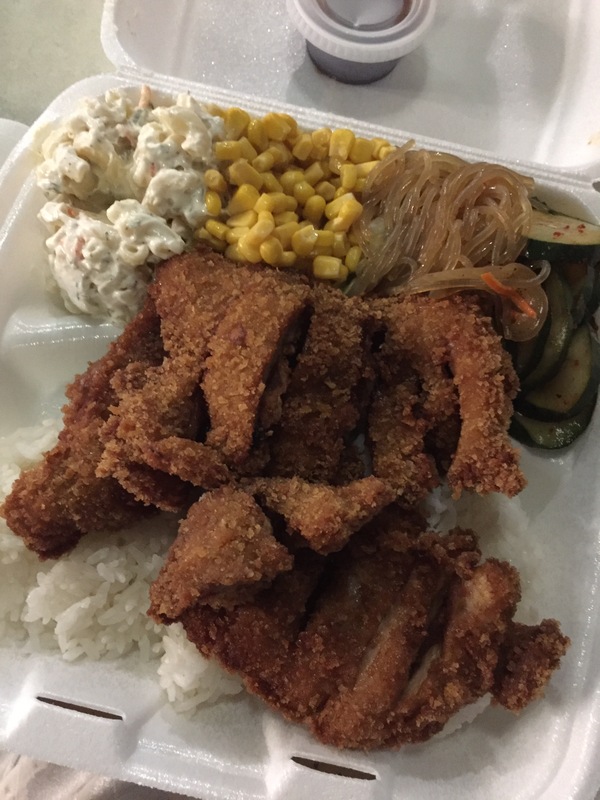 Not pictured: For a full mall with clothing other than tropical button ups, head to the Queen Ka-ahumanu Center in Kahului. So when I read about Fourth Fridays, I was pretty amused because back home we have First Fridays. Apparently Every Friday here on MAUI they have a social event on different parts of the island and on the Fourth fridays of the month, it’s here in Kihei. 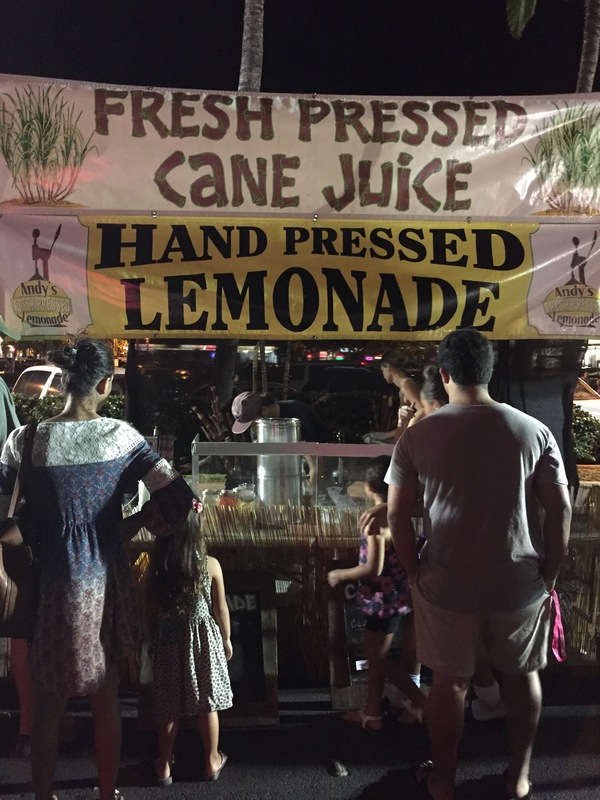 It’s pretty much your typical small local fair complete with shopping booths, a stage with a handful of singers lined up, activities for the kids (face painting, those water ball things you get in, etc), & most importantly, food trucks! It’s definitely a fun little event especially for families. If you’ve read my Seattle post, you know my boyfriend is a huge craft beer fan so local breweries are always on our list of places to go. 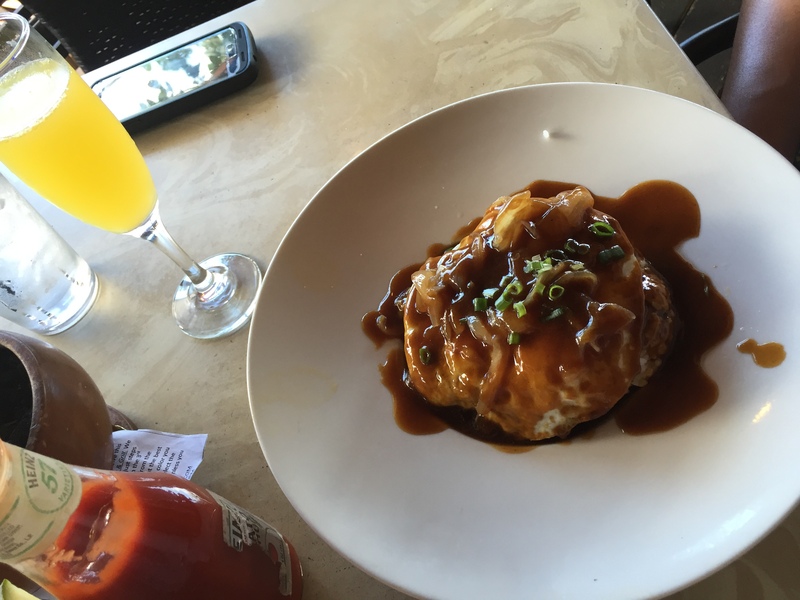 Maui Brewing Co. is perched right on top of a hill and has a great view of the sunset. 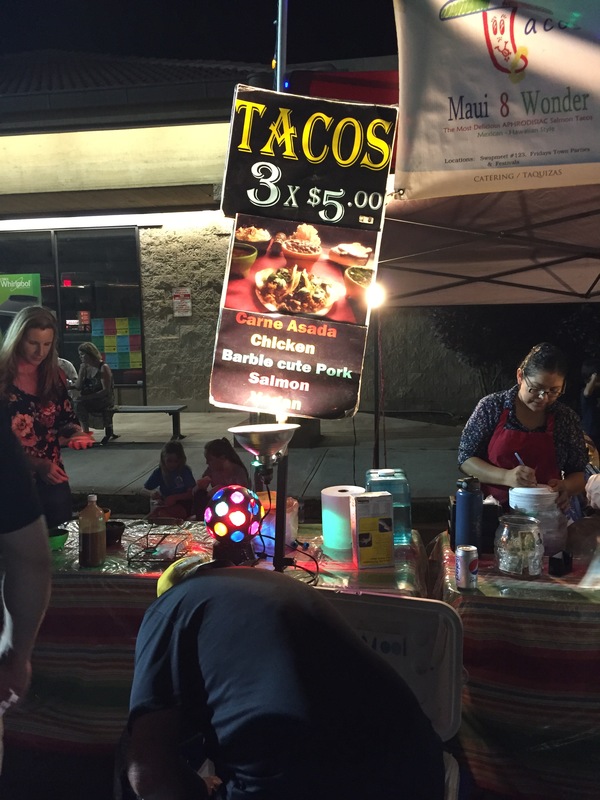 There’s also a couple food trucks right outside if you want to grab some dinner. 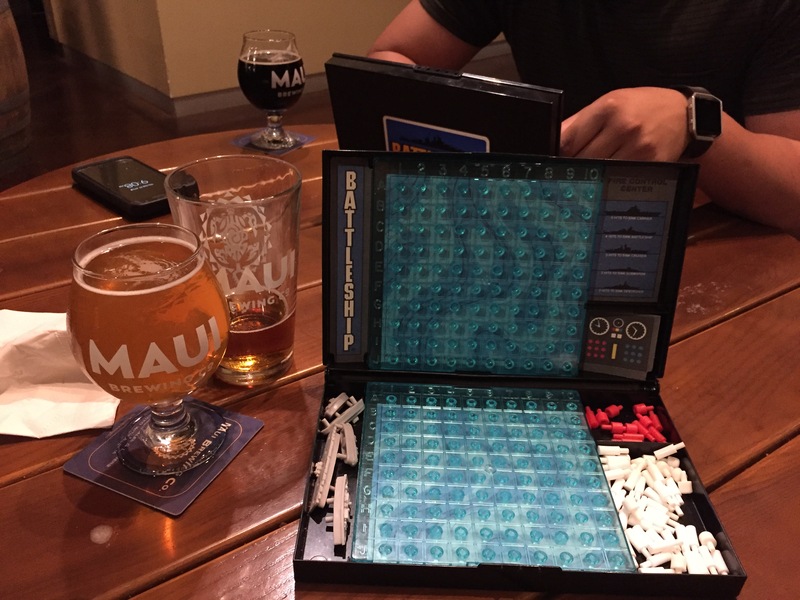 I loved that they had a ton of games to play, including a giant Connect Four, while enjoying their yummy brews. 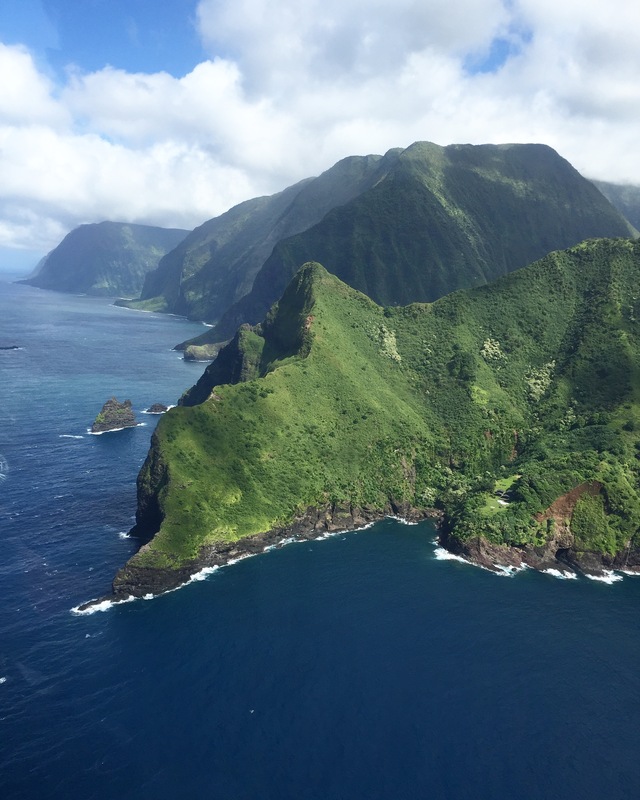 The Road to Hana is a beautiful scenic road to the small town of Hana. You’ll pass by many little treasures including individually run food/fruit stands, little shops, and gorgeous waterfalls. 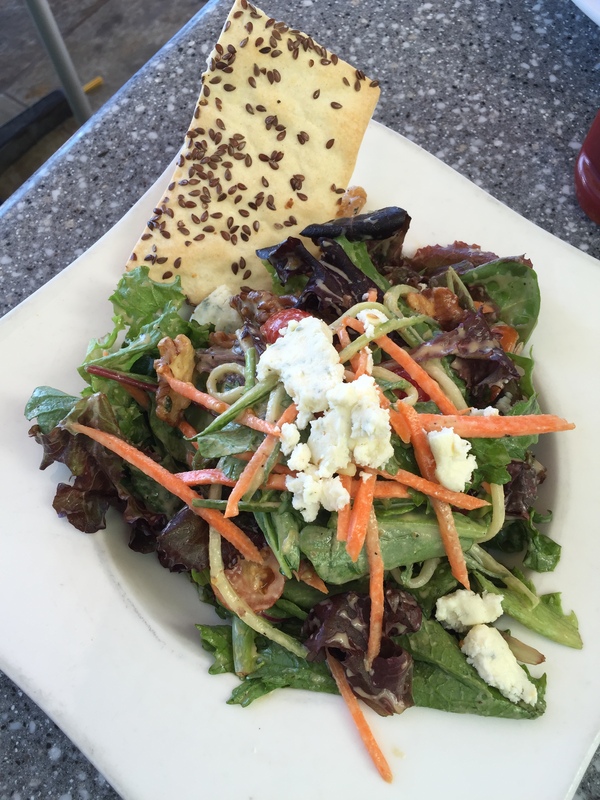 There are tons of places you can stop by along the way to just hang out and eat and a few little treasures you have to go off track for. It is a very windy road with paths narrowing to single lanes often so patience is a virtue. 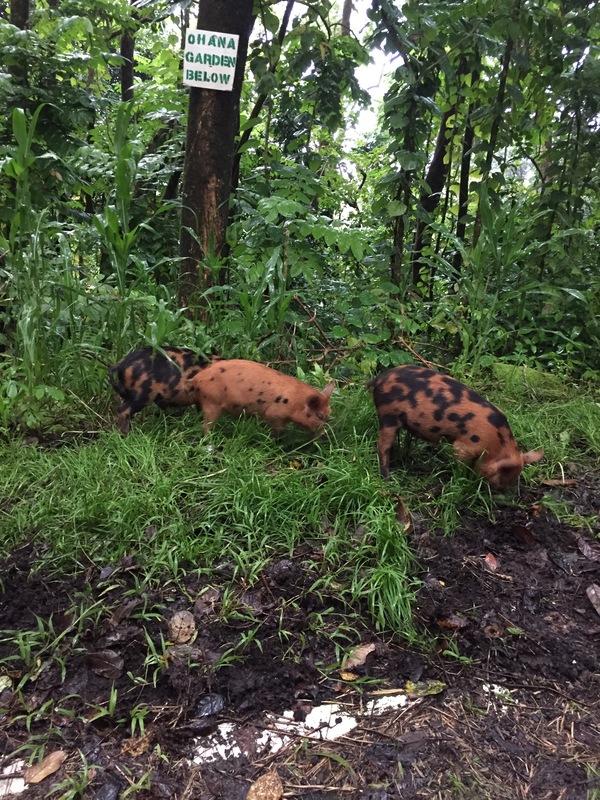 We saw these wild pigs and even a cow right alongside the road just chillin lol. 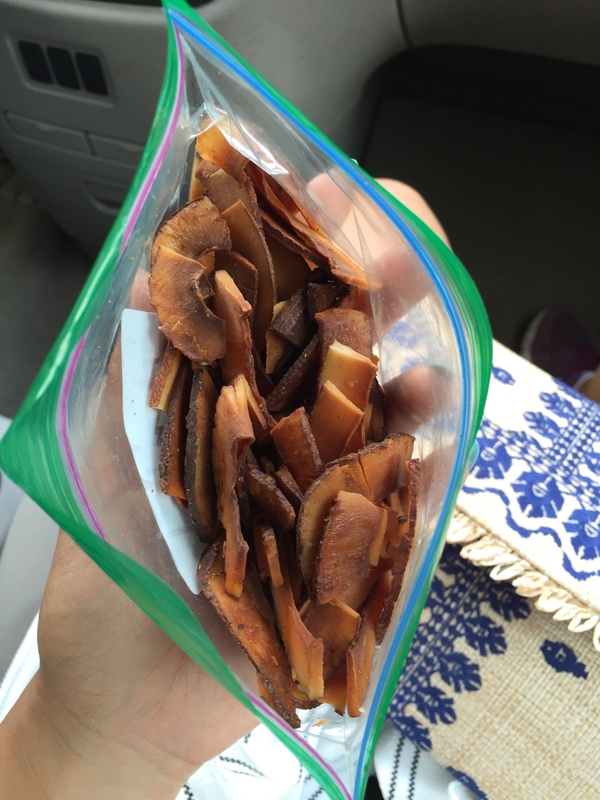 We also snagged some yummy Coconut chip candies at one of the shops! It was $5 a bag but it satisfied my sweet tooth. 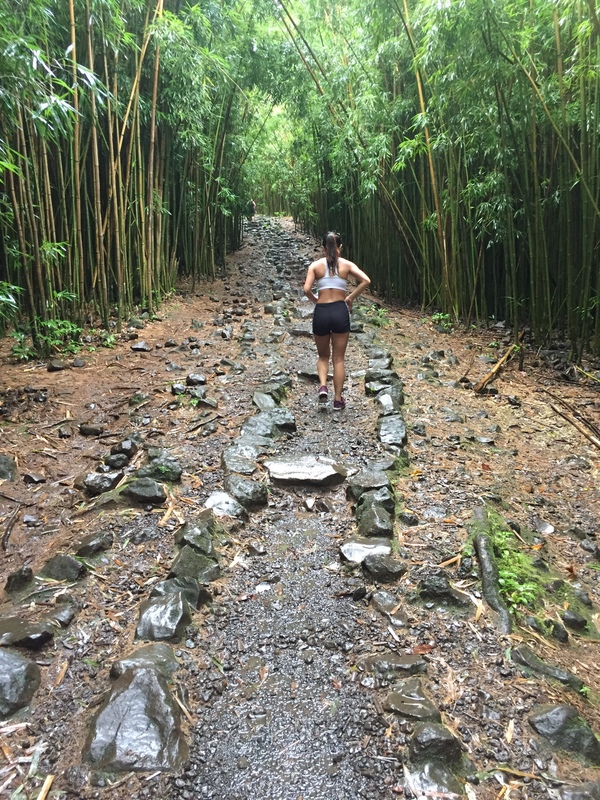 After the long journey through the Road to Hana, we finally made it to the Pipiwai Trail. It had been raining on and off on the way and didn’t stop once we got there but after that long drive, we were not going to let rain keep us from indulging in the gorgeous view that awaited us a short hike into the trail. The hike itself was moderate but very muddy. 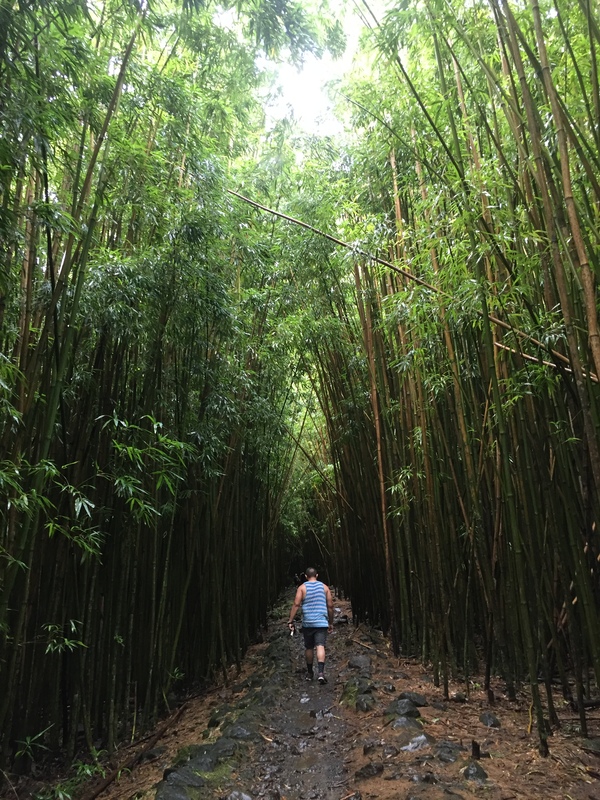 This bamboo forest was one of the most beautiful things I’ve ever seen. It was so majestic and felt unreal. 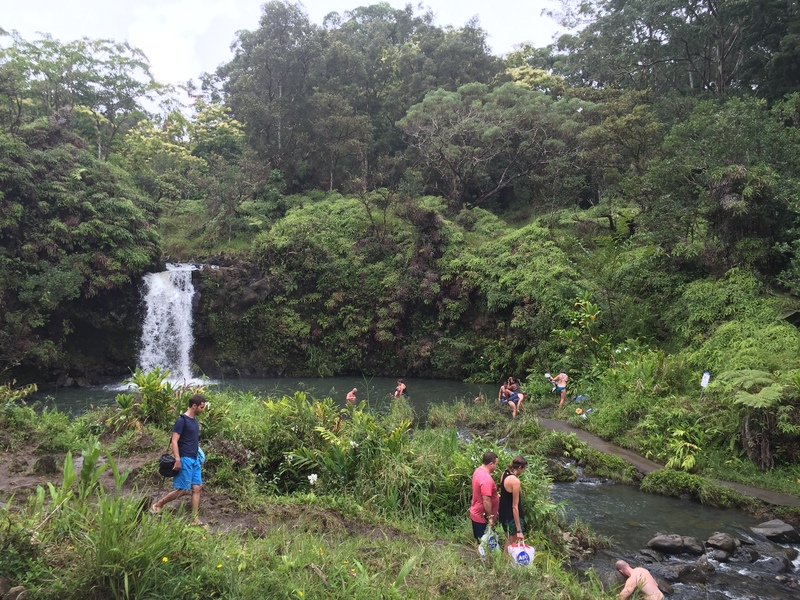 At the time we went, part of the trail had been closed off but if it’s repaired when you get a chance to go, the trail is said to lead to a breathtaking view of the waterfall. This was definitely one of my favorite parts of the trip. 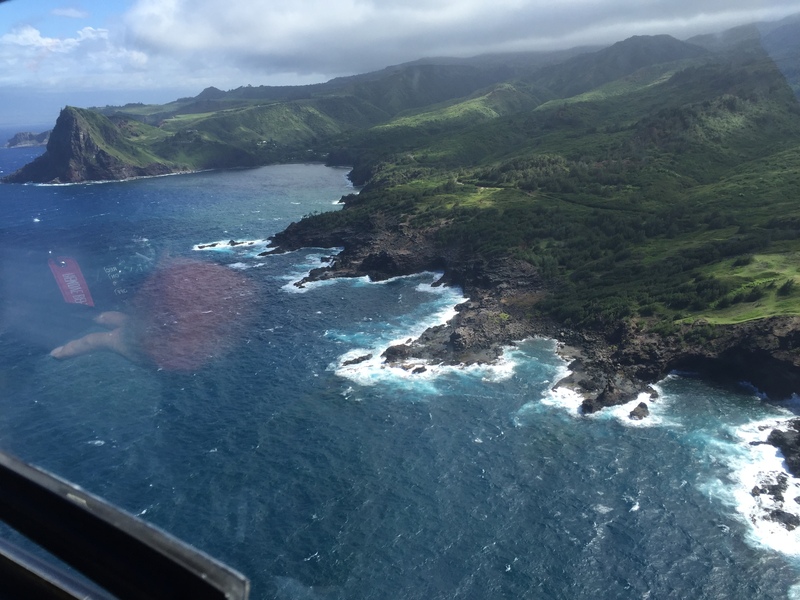 I’ve always wanted to go on a helicopter tour and what better place than around the gorgeous island of Maui. 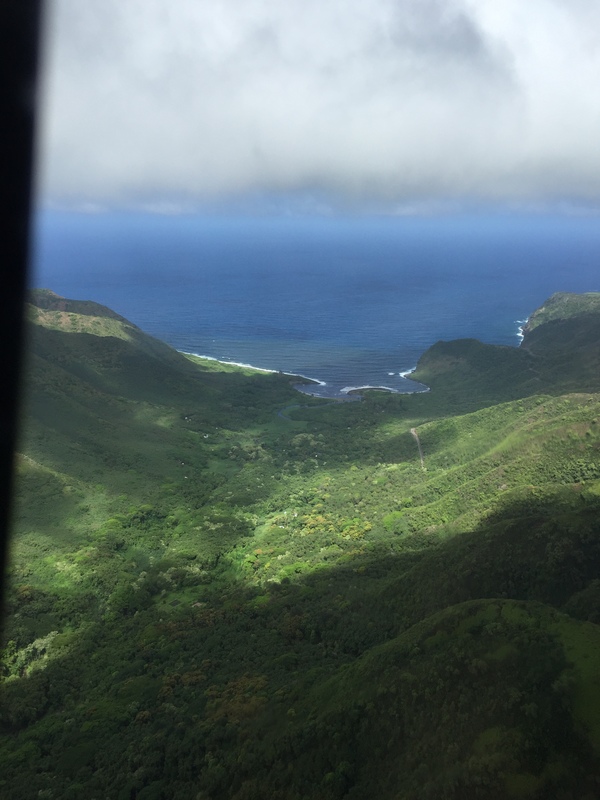 Our tour actually took us around West Maui and the Molokai island. If you skipped over the Food section, I was able to snag tickets for $60 each for a 45 minute tour which was a STEAL seeing as how they were $250+ ea when I was looking them up prior to our trip. It was an absolutely beautiful day and we learned so many interesting and fun facts about the island and it’s inhabitants. 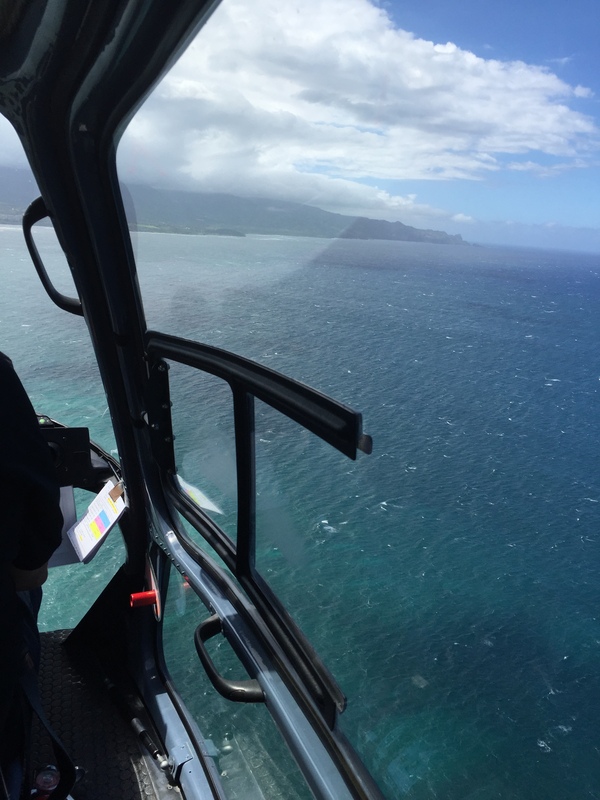 They brought 6 passengers on the tour, but our guide made sure to always turn the helicopter around so that everyone was able to get an amazing view. 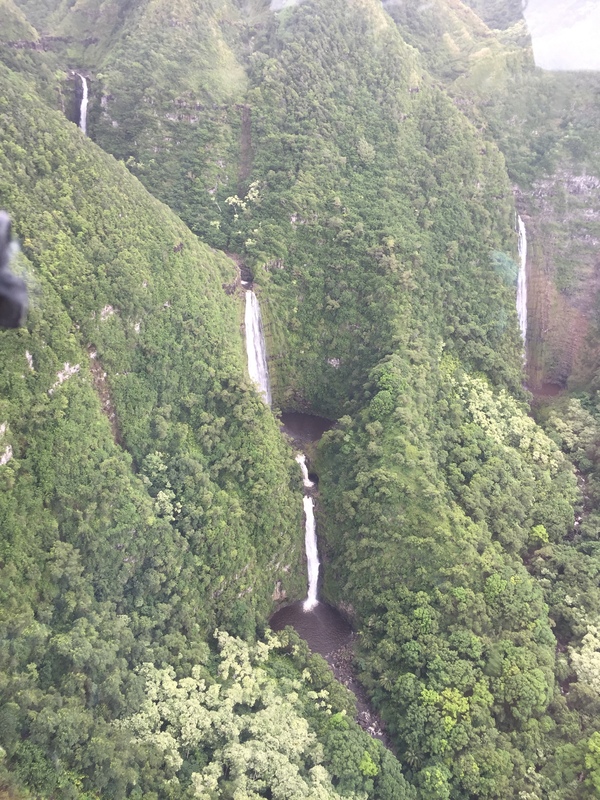 We witnessed the biggest, most beautiful waterfalls of the island which you wouldn’t be able to experience any other way as well as the world’s tallest seacliffs. 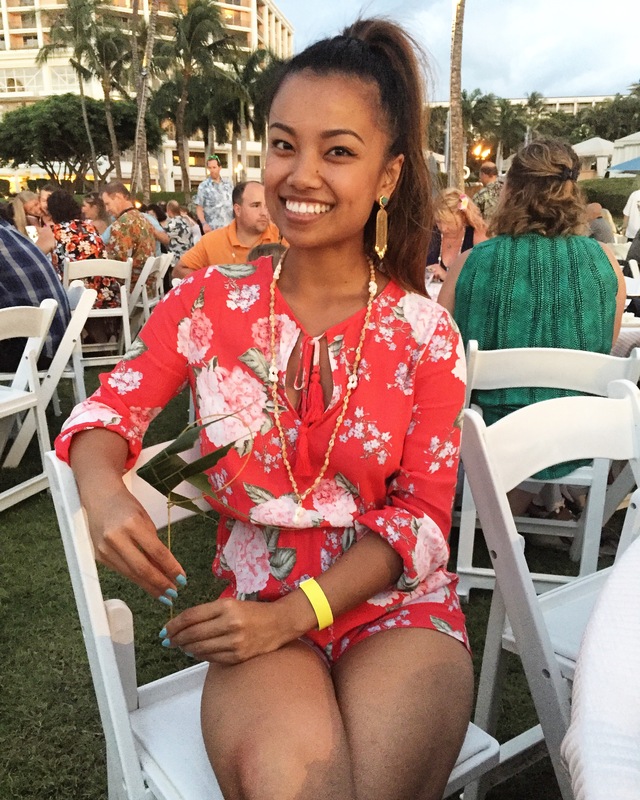 When you go to Hawaii, you have to go to a Luau right? Well, in my opinion, they’re fairly underwhelming & Daniel didn’t have rave reviews for this one compared to the one he went to in Lahaina earlier in the year. 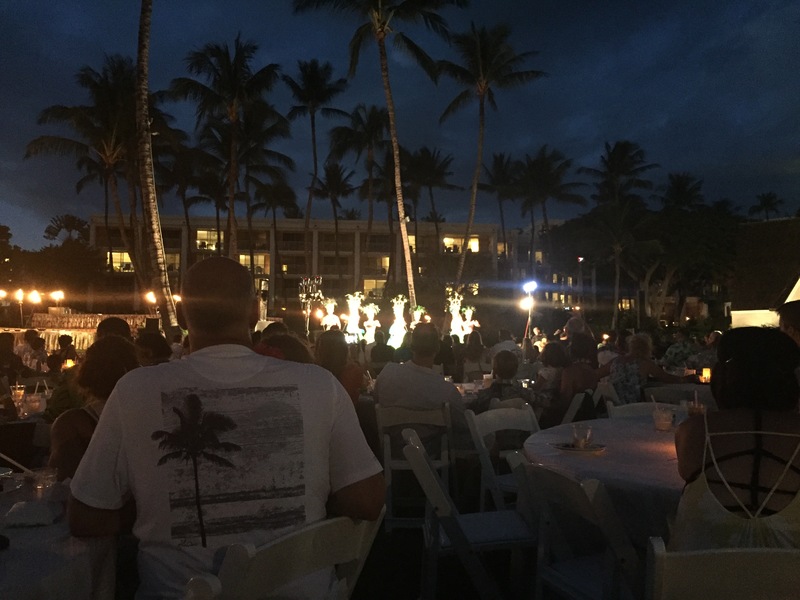 The Luau came with an open bar and dinner & a show. The open bar was cool lol but the dinner selection was limited. 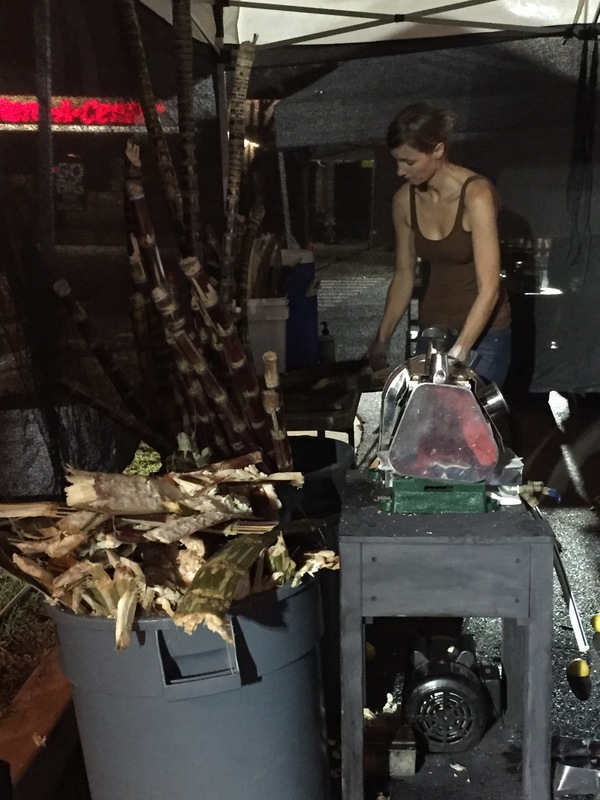 I did enjoy the hula & fire dancers and their interpretive story telling but the night just seemed to end sooner than expected. 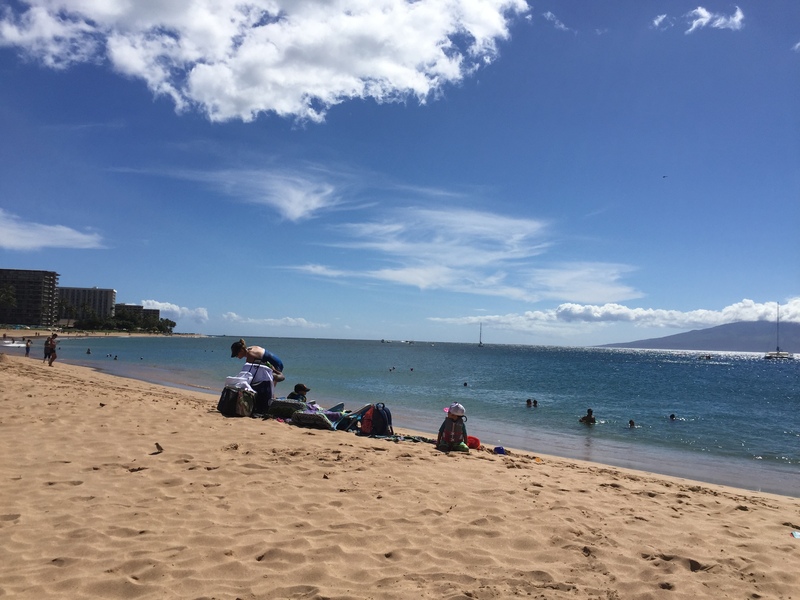 Kaanapali Beach is famously gorgeous and known for the sea turtles that hang around the reefs as well as the little cliff you’ll see all the kids doing flips off of. We rented some snorkel gear from Snorkel Bobs in Kihei for like 9 bucks a day. We did get to see (just one) sea turtle and boy did he look lazy lol. 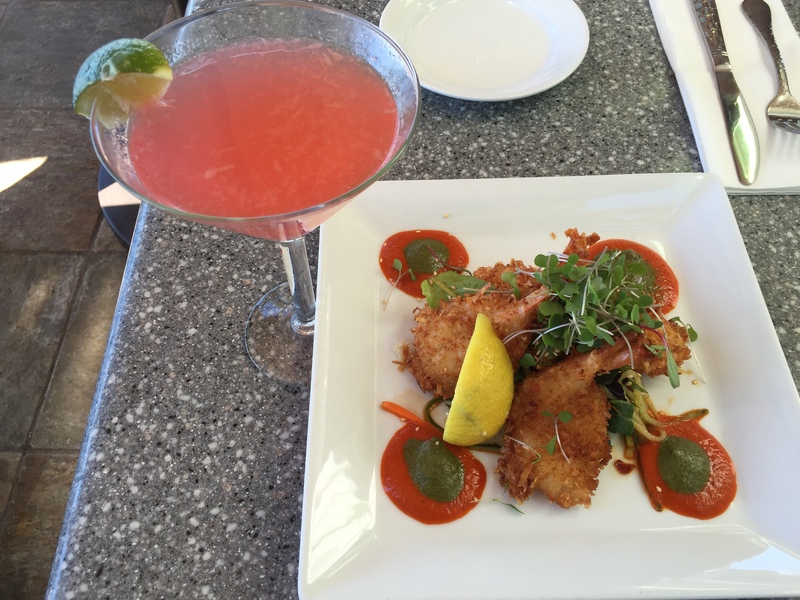 Our favorite was seeing a little octopus that just looked so luminescent, it was hard to take our eyes off of it! 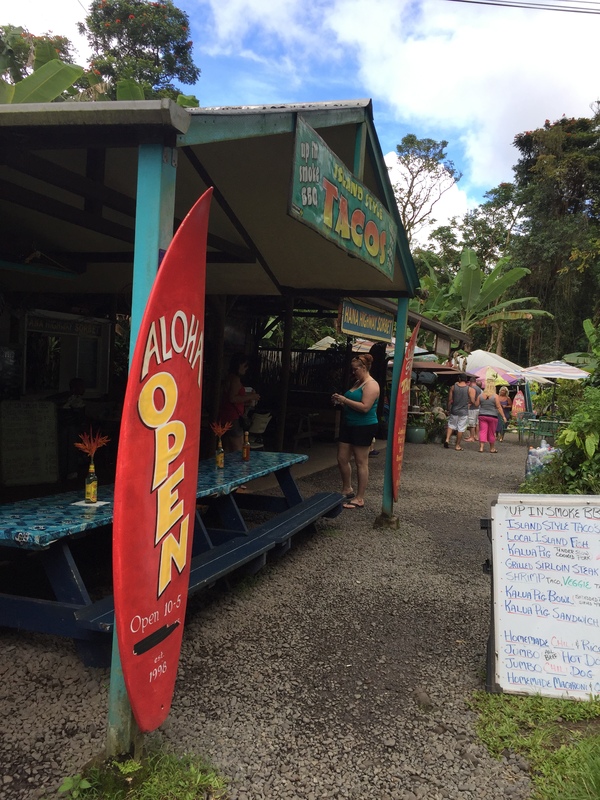 It wasn’t overcrowded and is a great place to kick back and relax because you could walk right over to the hotel outdoor bar behind the beach and grab some food and drinks to reenergize yourself for some more snorkeling! P.S. The handbag in the middle picture is the treasure I found at the Maui Swap Meet!